Trailer and Poster for Shane Abbess' INFINI! It's been seven years since Shane Abbess impressed audiences with his his stylish, low-budget purgatory actioner Gabriel (review), but after some false starts on a few projects (including being attached to direct Source Code, which eventually went to Duncan Jones), the Australian director is back in good form with Infini a scifi thriller with a great atmosphere reminiscent of Event Horizon. 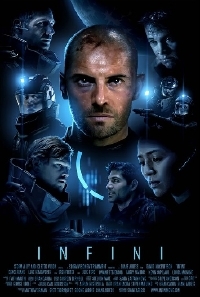 Set in the dark reaches of space, Infini is the story of a search and rescue team transported to a distant mining station to save Whit Charmicael (Daniel MacPherson) who is the lone survivor of a freak accident. Using Slipstream technology the team must transport into a hostile environment and quarantine a lethal biological weapon which is set to arrive on Earth within the hour. Infini stars Daniel MacPherson, Grace Huang, Luke Hemsworth. More on the release of Infini as it comes folks! Duncan Brown was an Immediate recording artist from the 60s. Gabriel was awesome. My favourite film. This looks very Event Horizon. Another of my most liked films. Here's hoping to a good flick. What!? This is Looks Great!